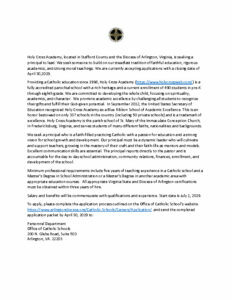 Parish Night Out!-Last Chance To Buy Tickets! Parish Night Out is almost sold out—don’t miss your chance! Easter Sunday is the last day to buy tickets! Join us for a great night of fun and catching up with parish family and friends. Includes dinner and dancing to the music of The Andrew Thielen Big Band, at the Jepson Alumni Center at UMW. Tickets are $75 per person. Friday, April 26, Cash bar 6-11pm, Dinner 7-8pm, dancing until 11:30pm. Not only a great value for the money with the great food and orchestra—the night includes drawings for great door prizes throughout the evening—wine and champagne packages, movie tickets, restaurant gift certificates, Theater passes, and more… Please join us! For info or tickets, please call Marty at 540-373-0259 to reserve your table! 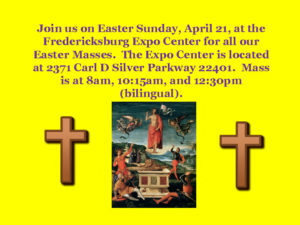 ALL EASTER MASSES AT FREDERICKSBURG EXPO CENTER!